We had a Hanukkah party to attend this past weekend and I, naturally, created the card for the hosts at the very last minute, which is why this is being posted after Hanukkah. LOL! BUT, I still think it is such a pretty card! I have been using this design quite a bit lately. I just change it up to suit different colors, icons, etc. The dies are from all over the place. LOL! The 8 is from CAS-ual Fridays, the snowflake is Avery Elle, and the tag is WPlus9. The stamps are all from the 8 Happy Nights stamp set from CAS-ual Fridays. I used silver embossing powder to give the snowflake a dip dyed look and strung May Arts metallic string through the tag. I know this is a busy week for lots of folks, but I do hope you will stop by when you get a chance! I will have some fun things to show throughout the week! Love your card and design! This is a fantastic Hanukkah card! I'll have to look into this set. I like that it has something other than a menorah. This is GORGEOUS!!! Those colors - swoon! I LOVE them! And that design is so cool!! 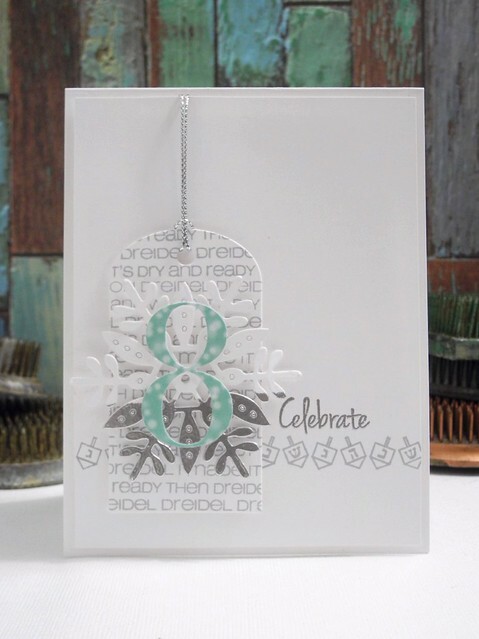 Love the dip dyed snowflake and 8 an tag - all AMAZING together!! Love!!! !